It is one of the most characteristic of the white area, with its straw color with fruity and persistent, a good body and harmony of taste. Production area: The area in Lombardia and Veneto between Pozzolengo, Sirmione (in the province of Brescia) and Peschiera (in the province of Verona). It is a naturally clayey and calcareous soil, situated 50/60 m. above sea level. Lugana is a small area in the hinterland of the southern coast of Lake Garda, that goes from Desenzano through Sirmione and Peschiera to the Pozzolengo and Lonato districts. The wite wine Lugana D.o.c. is produced in a landscape of unique beauty, which is famous all over the world for its wonderful view over the Lake Garda blue waters, surrounded by the Alps in the background. 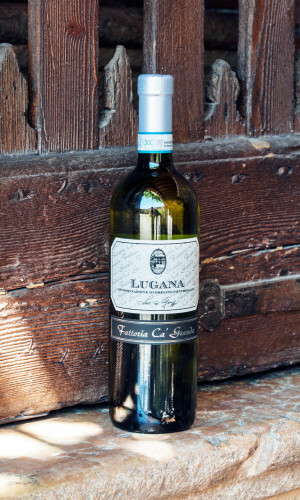 The Trebbiano vine of Lugana distinctly differs from all other Italian Trebbiani. It is brilliantly clear, typically straw yellow in colour, but with sharp greenish tinges that become golden when the wine is aged.